So a new set is here, and while our eyes are immediately drawn to the new shiny things, this is the exact time that we want to be thinking ahead. Khans of Tarkir and Fate Reforged are going to rotate in April, when Shadows over Innistrad arrives. This is the beginning of the new rotational schedule, 18 months in Standard instead of 24. What I want to look at today are the cards that are currently underpriced, since they are in Battle for Zendikar and the supply is just about at maximum. My philosophy for years has been to trade for these types of cards now and then trade them away in six months or so, when demand is high and yet it’s no longer being opened. An example of this in action is Hero’s Downfall. That low point, during Born of the Gods and Journey into Nyx? That’s where we are with Battle for Zendikar. See that spike during the beginning of Khans of Tarkir? That’s my exit point. I’m not skilled enough at deckbuilding to say with certainty what decks will be good and what won’t after rotation. What I do know is this: losing the fetch lands is going to hurt these four-and-five-color monstrosities, running twelve fetches and six or seven battle lands. If Shadows over Innistrad contains the enemy fetches (Scalding Tarn and the like) then I’m probably going to be super wrong and that’s going to be a mea culpa moment. This is the easiest call of all. Supply is at maximum, and everyone has all they need for their decks. The dirty little secret of the battle lands and the manabases right now is that you don’t need the full playset of each land. You need one or two, since fetches get you exactly what you need. When there is no Windswept Heath, decks are going to need to draw their lands. Even if you want to run more pain lands (for the colorless) then you still have holes to fill and that means you’re going to increase the numbers of battle lands you’re playing. Take a Jeskai Black deck or an Abzan Blue deck. Depending on the flavor, it’s running between five and eight battle lands of three or four types. No four-of on these duals, because fetches obviate that need. Take away the fetches and I think deckbuilders go back to three-of and four-of, which means the prices on these will conservatively double. That’s right — I think even Cinder Glade will be in the $6-$8 range before we get the second set of Shadows Over Innistrad block. It’s true that this is being overshadowed by Kozilek’s Return, and for the most part that’s merited. This is a sorcery, and colorless mana doesn’t help with converge at all. I think that Radiant Flames is super cheap for what it does, though, and it doesn’t seem unlikely for there to be a rise in decks that want to wipe the board of small things for three mana. Plus, the price to get in is so low that your risk is super low as well. Stay away from the promo, though. Pick up one if you have to have the full collection of promo foils but this one doesn’t have much appeal to Cube or Commander. I can’t wait to trade these away at $3. Speaking of cheap sweepers! This is a total flier. It’s almost bulk in price and while it’s five mana, there aren’t many cards ever that offer the same level of “kill everything but the one thing I want to live” around. Martial Coup did it, Phyrexian Rebirth did it. I’m picking up about ten of these and crossing my fingers. There’s a little more risk on the buy-in here but the card already has pedigree. It’s too much life to be played as a four-of, and that is going to count against it. However, this card is starting to pop up in Modern lists and that makes it an appealing target indeed. I really like trading for cards that have a wide appeal, even they aren’t used in full playsets. I think that this will climb to about $5, if not higher. Holy Hero’s Downfall! It’s the same spell! A little worse, but a little better. What sent Downfall high was the rise of Mono-Black Devotion, but there’s a lot of reasons to go heavy black at rotation. The mana will be easier, and you’ll get this plus Grasp of Darkness. If you’re looking to kill creatures early and late, that seems like an awesome starting point. Path, Grasp, a couple of Flaying Tendrils…yeah, I like that plan. This is another card that won’t have to try very hard to get up to $5, or even more, depending on the decks being built. So if killing things is good, let’s stay on that path. This is a very powerful planeswalker who is seeing very little play. He’s amazing when ahead and great when behind, and I’m in for this climbing to at least $10. In the decks that want colorless, this is phenomenal. In the decks that want to get a lot of lands and land successive haymakers, it’s really good. In other decks, it’s pretty lame. But most importantly, it’s cheap and it won’t take much for this to be $3 in trade. This is one of my PucaTrade positions, getting them at 100 points and hoping to send them back out for 250-300 points in a few months. If Shrine gets good, so does this. Shrine is actually best friends here, as the loss of a land needs to be made up. The same principles apply. This isn’t a flier for three months from now. This is pure, unfettered, delicious speculation. Awakening Zone is up to $6 or so, though its last printing was five years ago. This is a better card, even for costing a mana more. I love picking these up and just putting them away, and the foils are sweet at $3-$4 too. Free tokens every turn are great, and using them to cast big things is amazing. I don’t intend this to be a comprehensive list, just the things that have caught my eye. Are there others I’ve missed out on? Comment away! With SOI presumibly containing vampires, I like it a lot in anticipation of a Monoblack Vampire Tribal deck. Cliff I respectfully disagree with some of your pics. Why would people NOT want the FULL ART Radiant Flames promo?? Flames and Path both have promos, I’m not sure why you are targeting these cards in regular printings. Ruinous Path is markedly WORSE than Downfall. How many decks ran 4 Dreadbore and how much did the price of that card go up to? Control doesn’t want to play sorcery speed removal, it’s hard to explain why it’s so much worse until you play control. At best it follows the path of Crackling Doom and gets up to $3-4, but Doom has been an amazing answer to cards like Ojutai and is instant speed. Speaking of which, Ojutai and the DTK all stars like Den Protector, Raptor, the Commands, Dragonlords, and other megamorph cards will all still be live…they are rarer and considerably better as a group. The 6 month rotation is weird but I think DTK and Origins cards will have one more spike left. and maybe BFZ will spike with Shadows or possibly the block after that. Ob Nix is never going to be a 4 of, but I can’t completely disagree that he becomes $10 although I am personally worried about who is going to want him because you only need 1 or 2 per deck. He also has to fight with Gideon, Ulamog, Oblivion Sower (which might still be a good spec) and all the Expeditions for price. $6 for a mono colored walker is a good buy in but I think it’s riskier than you do. When you play him you either fall in love or cut him, kinda like Narset Transcendent. I also don’t agree on the Battle lands, see Theros Scry land pricing. I feel like $5 (or6) was the most for the Theros lands and they were all 4 ofs in decks. If SOI has the enemy color Battle/Tango lands it’s going to crush 90% of the growth for the Battle lands. Players should get their play sets now, good and fine buy in, but I don’t see these returning much of an investment and don’t think it’s worth the risk. Just my opinion but I strongly believe in this one (or the Shadow lands will fit the next Standard better, and I think people are sleeping on the pain lands). I DO agree with Sanctum of Ugin…I had no idea it was only $1.50. It is part of the 2 card combo that makes Standard Eldrazi Ramp so great. $1.50 seems severely underpriced for a 4 of that is an integral piece of a deck. I think Painful Truths is safer than Ob Nix and your other suggestions. It’s tough to read if this is a Tasigur type card where the foil will be immensely better to target, but it is seeing Modern and Legacy play…we know what that does to foil pricing. Chapin was ahead of the curve on Gurmag Angler and that silly common foil jumped to $10. If he’s also right about Painful Truths look out. Also, Painful Truths looks to be the best draw spell post rotation by a very large margin (no Dig or Cruise) so I like that spec as well even though it has gone up a little bit already. To reverse field, I do appreciate you following through on the title of your article… You were picking underpriced BFZ cards with potential. I personally just like a lot of other cards to spec on like DTK and Origins cards. I also have had to scrape together profits on Khans cards I targeted at lows. To be honest cards like End Hostilities, Savage Knucks, Rattleclaw, and even Mantis Rider, Bloodsoaked Champion, Sarkahn, and Rhino have not yielded significant returns if any returns and these are all fall set singles so I suppose I’m a little jaded about fall set card investing. Luckily I got in on fetch lands well before they spiked and obviously they were the much better investment. Thank you for your work sir. 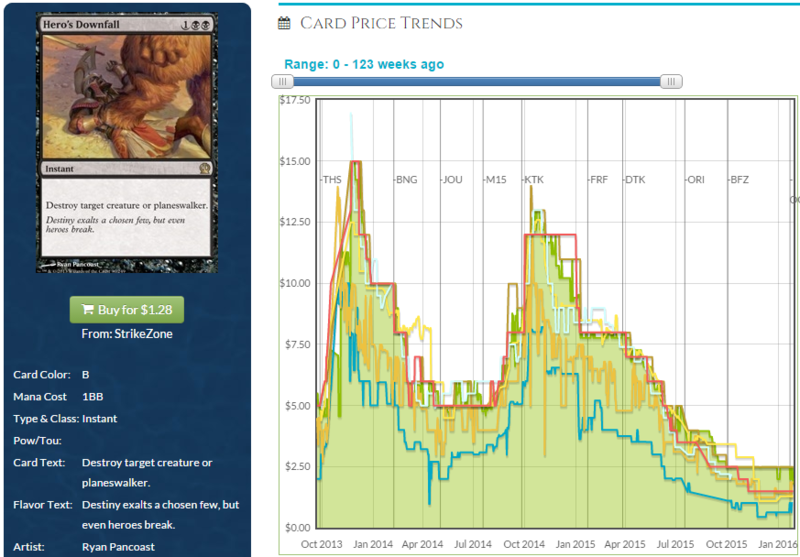 I hope you write about DTK and Origins cards next…or if you think there is time for another price jump. (Like Abbot seems poised for a jump as an integral piece of Atarka red and UR prowess). I wasn’t looking for anything but underpriced BfZ cards. The 18-month schedule means everything is happening faster. Thanks for all the feedback! I agree that Downfall is better but will we have a better spell than Path in standard? For the most part these are cheap bets. That’s why Drana isn’t on the list. I totally agree with Ruinous Path and Ob Nixilis. I’ve been playing with both in a B/W control build and they are quite competitive. Mana is perfect, that’s why. We have a modern-level manabase, a block with very strong multi-colored spells, and a complete absence of mana police (Blood Moon, e.g.). Spells like R.Path and Ob Nix are more difficult to cast in 4 color decks because BB is a choke-point. Ironically, it’s easier to play crackling doom and utter end than R.Path. Both are instants (Path is a sorcery), crackling doom basically reads “kill your best creature, take 2” and utter end has become the de factor removal for any problematic card. The latter is the only way to remove planeswalkers in most circumstances. Ob Nixilis is criminally underplayed. It’s an amazing card-advantage engine that plays best in creature decks. Abzan is a natural fit, but why play a five mana walker when you can splash blue for countermagic? Blue decks are incentivized to go heavier on U mana for Jace, dig through time, and treasure cruise. There might have been something in BG or Jund, but there wasn’t enough support for BG in Khans and BR has a very aggressive theme in both blocks. Ob Nix fits best in an attrition deck. He does everything an attrition deck wants to do. I’d be super surprised if he wasn’t in at least one T1 deck after rotation. I cut Ob Nix immediately after losing twice at an event to pillaging horde, the 5/3 dash creature. Abzan jammed 4 of them in the board for control and Ob Nix was horrible in that match up. He’s also horrible vs Gideon and Man Lands. Ob Nix is situationally great, but situationally great doesn’t cut it IMO. Ob Nix also does NOTHING vs Atarka Red. Gideon, token decks, and aggro make Ob Nix a miserable card to draw. Your point that BB is a choke point is correct, it is easier to cast a Mantis Rider than Ruinous Path. I’ll be curious to see what lands Shadows brings us and how that will affect the casting of cards. I assume that all the multicolored monstrosities we have now will go by the wayside and quite frankly we won’t need them. The Battle Lands are friendly and we’ll be playing Shards in no time…or the Pain lands and colorless Eldrazi cards will make the Wedge colors popular still. I was sure a landfall deck would emerge at some point but now I’m not so sure. What do you think about Undergrowth Champion? It looks like casual demand is keeping the price around $2.50 for non foils and and $5 for foils. Maybe there is a chance WotC thought Landfall would be too powerful with fetches? Maybe we get the key piece of a landfall/awaken/elemental deck in Shadows over innistrad? I’m not saying this card is great… But it is a pretty cool card that not only has synergy with landfall, but also has synergy with +1/+1 counters and its an Elemental. Does this have a chance of seeing standard play? If not… Does casual/commander demand warrant keeping an eye out for these in trades? Or is Undergrowth Champion doomed to slide down into bulk status. I was thinking Undergrowth Champion’s best chance at breaking out would be when Den Protector and Deathmist Raptor rotate out, leaving a huge hole where some green creatures need to be plugged in. My thoughts were Sylvan Advocate and Undergrowth Champion… as long as we get some sort of synergy going with awakened lands and whatnot. Or this little elemental will remain a tease for the entire time its in standard… Thoughts? Possibly, but then it will fall off a cliff upon rotation. In Modern, these lands are just plain worse than Shocklands. That limits the land’s appeal to strictly casual formats like EDH. For those purposes, I feel like 1 – 3 dollars is probably correct as a budget option for mana bases or a supplement to shocklands. So, if you’re looking to speculate and flip these, yeah, I guess it’s time to buy. If you’re looking to own them long term, I suspect you can do much better by waiting until BOZ rotates.